Active shooter events have happened all across the world. They can happen quickly, often before you realize what is occurring. Do you know what to do if you are caught in one of these horrible tragedies? 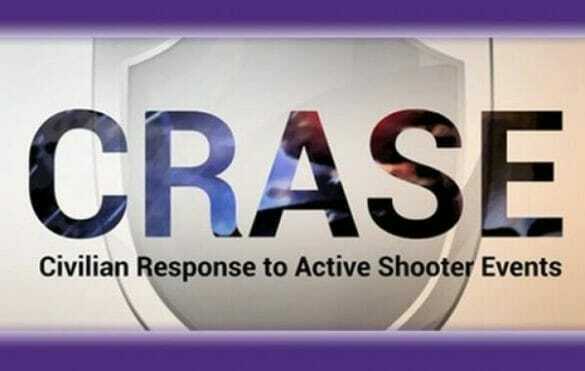 The Civilian Response to Active Shooter Events (CRASE) course provides strategies, guidance and a proven plan for surviving an active shooter event. Topics include the history and prevalence of active shooter events, the role of professional guardians, civilian response options, medical care, and interactive drills. The Hilliard Division of Police and Norwich Township Fire Department have partnered to provide this essential interactive training course to the citizens of Hilliard and Norwich Township free of charge! The course will be offered from 9:00 am to 4:00 pm on March 2, 2019 (1 hour provided for lunch). Each class will be limited to the first 25 registered participants. To register visit https://norwichtownship.simplybook.me/v2/#book/ and select the CRASE option. Sign up to reserve your spot! If you have questions or need additional information, contact FocusHilliard@norwichtownship.org or call 614-876-7694.